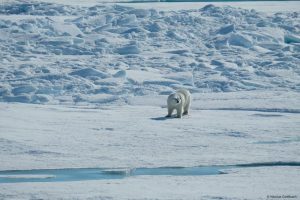 We are almost at the end of our cruise and after almost three weeks on board I have still not seen a polar bear! And that after participants of previous cruises had assured me that I would definitely see one. Even if there were none in central Fram Strait then at least closer to Greenland on our way to the Glacier. Because I had been monitoring the ice situation in front of the Glacier with satellite pictures since the start of our cruise, I knew how much luck we would need to be able to go there. Just one day before we had to make the final decision on our further cruise track our mooring sites in front of the glacier are still covered with thick fast ice. 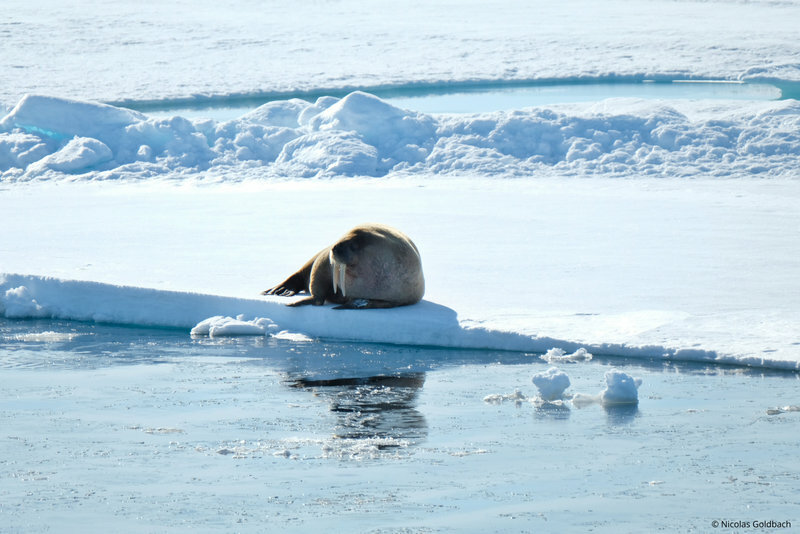 Fast ice is sea ice which is frozen to the coast, the sea floor or to grounded ice bergs. Even though Polarstern can break quite thick ice, we have to be able to push the ice to the sides and out of our way. This is not possible with fast ice. We could ram a path through the fast ice, but that would take time, time that we do not have. On the day the decision about our further course has to be made, the cruise leader, the captain and I anxiously await the arrival of the new satellite pictures. And wait and wait and wait. No pictures. We start to talk through all possible alternatives, and still no news. Finally, a new picture. I import it to our map viewer and then the disappointment: today of all days the satellite picture is cut off, exactly at the region we are interested in! The satellite, which takes the pictures, only passes our region twice a day at the most. But there are other satellites that pass overhead and take pictures approximately once every hour. These pictures have a significantly lower resolution and cannot see through clouds, but still better than nothing. One of the pictures shows something which may be a crack in the fast-ice. The crack leads right up to one of the moorings we want to recover. After I had almost given up hope of seeing Greenland we decide to risk it and take course due west. Early the next morning the excitement is palpable, when will we catch sight of Greenland? Will we find the crack? Will we be able to work there? Up to now we had almost exclusively bad sight and dense fog. But in front of Greenland the weather is supposed to be clear most of the time. I climb up to the bridge and see: fog. We can hardly see 100 m ahead, how are we supposed to find a crack only a couple hundred meters wide in this pea-soup? But the crew is hooked. I plot a map with all the information we have on bathymetry, ice conditions and mooring positions and point out the crack we want to follow. We’ll get you there, says the captain. By now I can make out the coastline of Greenland, if I use binoculars and know what I am looking for. It could just as well be slightly denser fog… But the lead scientist had promised me a view of Greenland when he asked if I would join this cruise. Now I have seen it, even if it did not look quite as I had imagined. We follow the ice edge, which we expect will lead us to the crack. Just as I had settled down again to my work and felt really motivated (after all, there is nothing to see except fog, I can just as well look at my screen), the fog lifts! 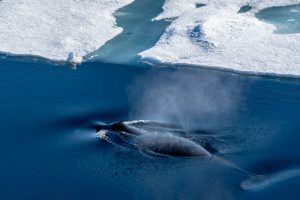 I rush on deck and see brilliant sunshine, the Greenland coast just beside us, enormous glaciers dazzlingly white, the sea ice sparkles with myriads of melt ponds and in between it all, us, in a narrow channel of dark blue water. The sea is mirror smooth and everything is calm. If there had been hardly anyone about before (the nightshift workers are asleep, everyone else is using the break in the work to stay below deck, in the labs or in their cabins), now it is almost crowded on deck. The nightshift people are being woken up (no one wants to risk missing anything), the cameras, sunglasses and binoculars are unpacked and we enjoy the spectacular view. I have never seen anything like it. The ice is awe-inspiring. I can hardly comprehend how huge everything is. And now, after weeks of fog, everyone’s smiles seem to outshine the sunshine. Most of the scientific crew stays outside and grants themselves a short break, after all we can always continue work once we have fog again! The mood is great, but it gets even better! 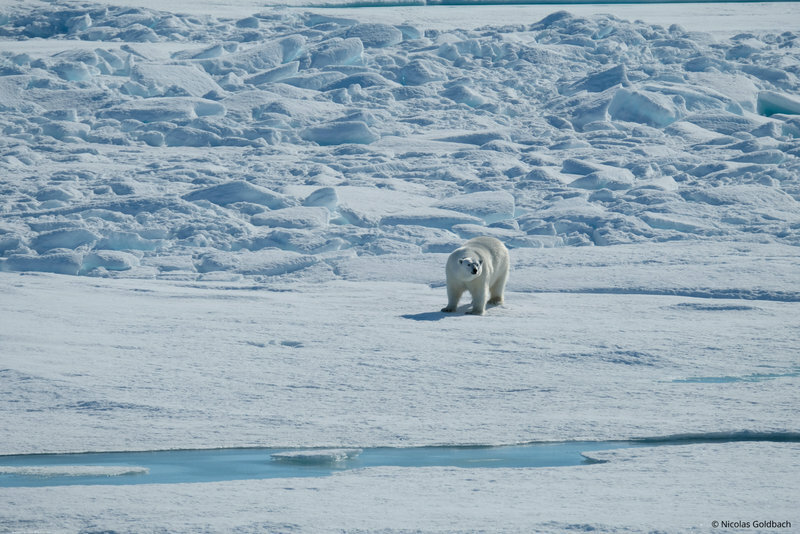 Just as we have finished recovering the first mooring we spot a polar bear. He is quite far away, but I have binoculars. A colleague looks through them and squeals, “o my god, he is so fluffy!”, I have to hide a grin. The polar bear really does look fluffy, and adorably clumsy. He has a well padded backside and is apparently completely uninterested in the enormous ship that has invaded his habitat. Every now and again he looks over to us but otherwise he ambles about yawning, lies down, rolls in the snow, walks on again and gives us ample opportunity to observe him. Just after we recovered the last mooring we could reach, the first mate barges out of the bridge onto the deck armed with a camera and excitedly points downward. A walrus is lying on the ice floe we are steaming around, directly next to Polarstern. This is unusual enough to warrant an announcement by the second mate: „Ein dickes, fettes Walross auf der Backbordseite! A big, fat walrus on the portside!“ and a few minutes later the next announcement: „Wal direkt voraus! Whale, straight ahead!“. It is hard to believe what luck we have! After an exciting day I fall into bed, exhausted but happy and tired from the sun. I am pretty sure everyone will have sunburn tomorrow, but it was worth it. The work, the fog and the sleep deprivation are all forgotten. Some days we have the most beautiful workplace in the world. Sounds great, I see from tracking that you are in clear water north of Morris Jessup! Are there plans to travel further west, it looks like you might be able to make it to Nares strait? That would be a pretty rare opportunity.